You’ve heard the old adage. If all screened porches were the same, it would go something like this. A screened porch is a screened porch is a screened porch. This couldn’t be farther from the truth. Not only do screened porches vary based on the size, shape, and roof style, they vary by all the components within. Imagine putting together a car. Imagine if all LX or EX models were exactly the same. Sure, those packages indicate a number of upgrades but that package only specifies a small number of options that are standard with that model. These could include power windows or doors or leather seats. But what about paint color and 2-door vs. 4-door. What about automatic transmission vs. manual transmission? What about carpet colors and dashboard packages? Radios, navigation systems, power seats… I could go on and on. 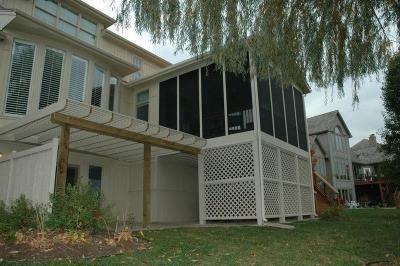 Unlike a car, a screened porch is truly custom through and through. Here are some of the things that differ. I’ll discuss both exterior and interior. On the exterior, here are some of the styles, shapes and sizes to consider. The first one is the roof shape and style along with the roof overhang and soffit overhang. I wrote a blog post earlier about roof styles. Fortunately a good custom builder can help make that decision a lot easier. You don’t want your screened porch or any other outdoor room addition to look like an appendage. As much as possible, you want to make it look original to the home. So, by emulating your home’s roof style, that often creates the best aesthetic look for your new outdoor room. One of the next considerations is what the support columns will look like. Again, your home may have columns either in the front or the back but we can help you make the best selection to fit your home, your tastes and your preferences. Attached to the supports will be the type of screen. There are a few choices here including metal, vinyl/woven or fiberglass/mesh. A good custom builder will also walk you through one of the biggest exterior options which is the type of trim. These include the screen trim, post trim, and roof trim. Options include cedar, pine, man-made trims, vinyl, and more. They all have different characteristics and prices. This entry was posted in porches, Screen Porches, Screened porch and tagged Archadeck KC, Archadeck of Kansas City, custom screen porches, Kansas City custom builder, Kansas City custom outdoor builder, Kansas City room additions, Kansas City Screen porch, Kansas City screened porches, Overland Park KS screened porch, Screen Porches, screened porch Kansas City, screened porches, screened rooms on July 26, 2011 by archadeckkansascity.